Garnet is both the traditional and modern birthstone for the month of January. The most popular color of garnet is the blood red Almandine Garnet, but you can choose a garnet color from just about any in the rainbow. All colors of garnet are considered the January birthstone. Garnets are commonly found as small pebbles in streams, where the igneous and metamorphic rocks that contain them have weathered away. The spectrum of colors in the garnet is due to their range of elements such as iron, calcium, and manganese within each particular gem. In the red family, there is the pretty pinkish red to purple variety of Rhodolite, the blood red Pyrope and darker Almandine or the orange of the Mandarin Garnet. 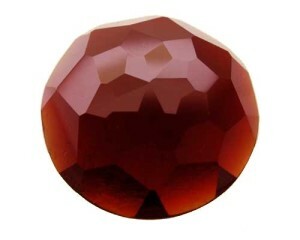 If you favor brown tones, then go with Hessonite. Green lovers will lust for the multiple shades of Tsavorite and Grossular Garnet, which are also available in golden and yellow tones. 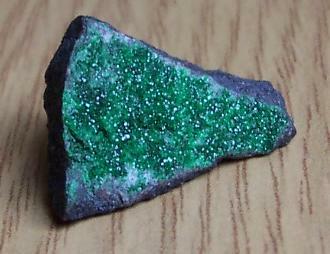 Uvarovite is an attractive bright green due to its high levels of chromium. There is even a rare blue garnet, discovered in the late1990s in Bekily, Madagascar. It changes color from blue-green in the daylight (which is a light that is stronger in the blue green wavelengths) to purple in incandescent light (which is a light that is richer in the red wavelengths) because of the relatively high amounts of the element, vanadium. Garnets containing titanium and manganese are considered Andradite garnets. The most valuable garnet of this group is the emerald green Demantoid. Topazolite is the name for the yellow variety and Melanite is usually black but can also be a dark red. It is found in metamorphic rock and volcanic lavas. As there are no gem treatments commonly used on Garnet, it is safe to assume the gems used in jewelry are natural and the color and clarity are unenhanced. The name Garnet comes from the Latin granatum malum which means pomegranate, because the gems resemble the fruit’s rich red seeds in size and color. Through history, Garnets have been thought to promote healing - especially with blood disorders. During the Middle Ages primitive cultures believed that the red stones would stop bleeding. Many early cultures believed that garnets were helpful in preventing and curing blood disorders and infections. Today, the garnet is a symbol of a light heart, loyalty and deep, enduring affections. Garnets are also considered the protective gem of travelers. A gift of garnet is a symbol of love and the desire for a loved one's safe travel and speedy homecoming.